Rising above a prime stretch of beach, North Beach Plantation is an upscale North Myrtle Beach Resort with an oceanfront water park. 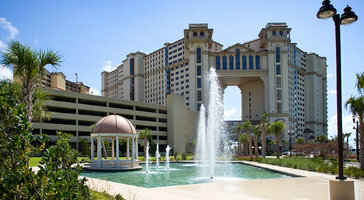 Located in the very first part of North Myrtle Beach, you’ve got plenty of breathing room. The caribbean themed aquatic playground features six outdoor pools, with splash zones for the little ones and a swim-up bar for the adults. There’s also an indoor pool with a lazy river. Treat yourself to a soothing massage at the Cinzia Spa located onsite. Head to the fitness center for some exercise or take a pilates class offered at the resort. For a bite to eat, the resort is home to the 21 Main Prime Steak House, which serves gourmet dry-aged steak and fresh sashimi at the sushi bar. All condo rentals are decorated in an elegant Georgian style and feature full kitchens, living and dining rooms, private balconies, and washer/dryers.